Organic USDA Baby Shampoo & Body Wash. 100% Organic Calendula, Lavender, Coconut Oil and essential oils. No parabens, sulfates or dyes. GMO and gluten free. Product prices and availability are accurate as of 2019-04-08 03:01:11 EDT and are subject to change. Any price and availability information displayed on http://www.amazon.com/ at the time of purchase will apply to the purchase of this product. 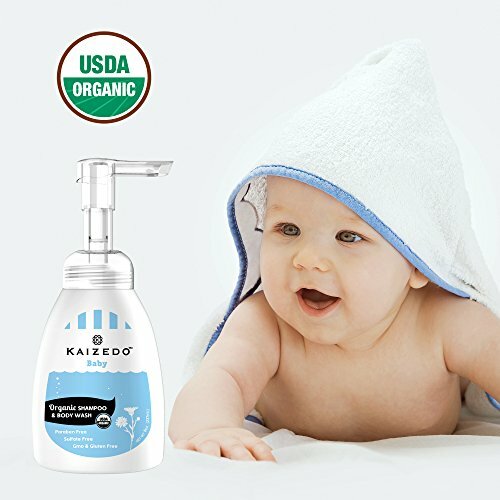 Kaizedo USDA organic baby shampoo & body wash is a low foaming castile soap based formula which consist of only 100% natural and certified organic ingredients that are safe and effective. Recommended for babies under the age of three. Your baby's delicate and sensitive skin will be gently cleaned and moisturized. 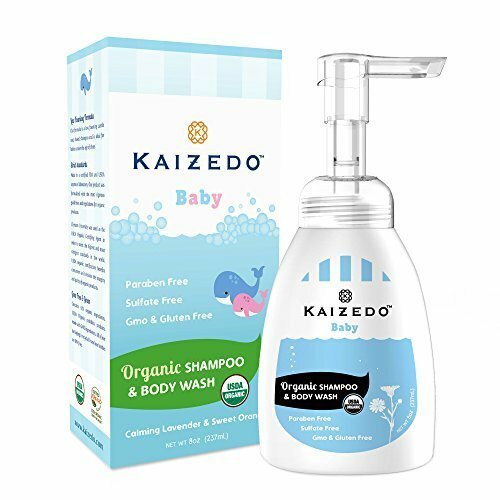 USDA CERTIFIED & EWG TESTED: Kaizedo baby shampoo and body wash has been formulated and tested by a third party in order to meet USDA stringent standards. USDA organic certification benefits consumers as it ensures the integrity and purity of the product. SKIN DEEP Rating Score of 1. The relaxing and soothing combination of organic lavender and organic sweet orange will relax your baby. Organic coconut oil, sunflower and calendula will moisturize, leaving your baby's skin soft. DIRECTIONS: For external use only. This is a gentle-tear shampoo so please avoid contact with eyes. Tear-free shampoos contain eye numbing chemical ingredients that are purposely omitted by Kaizedo. Gently smooth onto your infant's hair and body. Rinse well with warm water. 100% MONEY BACK GUARANTEE: If for any reason you are unsatisfied, just email us stating the reason you are unhappy and you will receive a courteous and prompt refund. It's that simple! Proudly made in the USA. 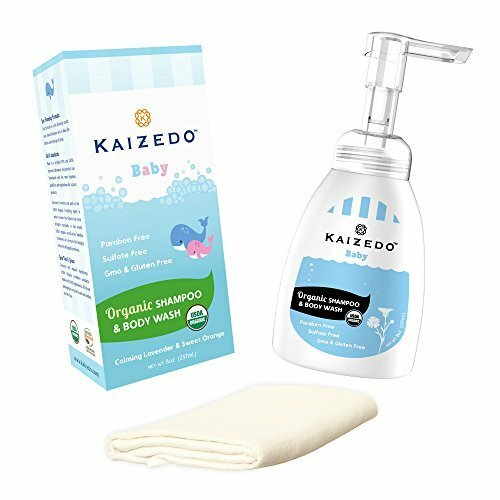 FREE ORGANIC BAMBOO WASH CLOTH: Kaizedo Baby Shampoo comes with a complimentary 100% Organic Bamboo wash cloth with each purchase. EASY-TO-USE FOAMING PUMP: The easy-to-use foaming pump makes it simple and convenient to bathe infants. ALL ORGANIC INGREDIENTS: Our premium product contains 95% USDA certified organic ingredients that are gentle for your baby's sensitive skin. The combination of organic essential oils and nondrying organic ingredients will relax and soothe, leaving your baby's skin smooth and soft. Our organic natural ingredients are biodegradable and will not harm the environment or pollute water sources. Never tested on animals. Cruelty free. 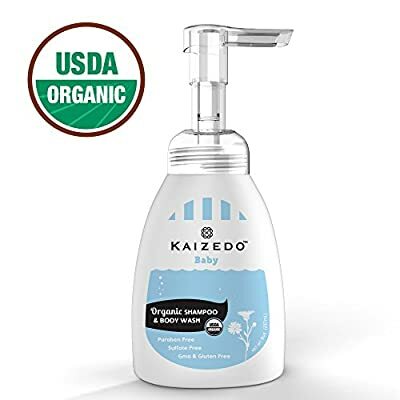 USDA CERTIFIED: Kaizedo baby shampoo and body wash has been formulated and tested by a third party in order to meet USDA stringent standards. 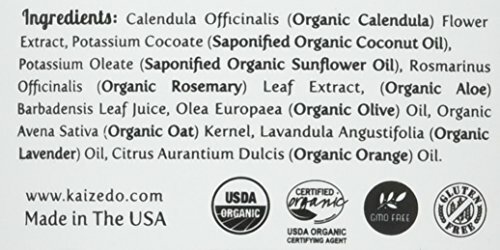 USDA organic certification benefits consumers as it ensures the integrity and purity of the product. 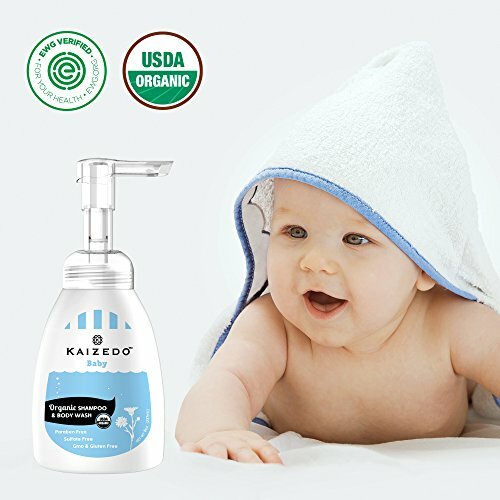 ECO-FRIENDLY AND SAFE: Kaizedo Baby products provide only the best, premium organic skin care formulations for babies.